A wealth of information from start to end. As the polio case is the most commonly used in arguments for the desirability of vaccines, I find this at least as important as anything else I have published on ‘The Golden Rule’. Apologies for direct copying most of the article, but it deserves to be on different sites for posterity. Even during the peak epidemics, unifactorial poliovirus infection, resulting in long-term paralysis, was a low-incidence disease 2 that was falsely represented as a rampant and violent crippler by Basil O’Connor’s “March Of Dimes” advertising campaigns. At the same time as Basil O’Connor was pulling in 45 million dollars a year to fund the Salk vaccine development, scientists started to realize that other viruses like Coxsackie, echo and enteroviruses, could also cause polio. They also discussed the fact that lead, arsenic, DDT, and other commonly-used neurotoxins, could identically mimic the lesions of polio. During the great epidemics in the United States, the pathology called polio was reversed by alternative medical doctors who attested to great success, using detoxification procedures available at the time – yet they were categorically ignored 3. Prior to 1954, the following undoubtedly hid behind the name “poliomyelitis”: Transverse Myelitis, viral or “aseptic” meningitis, Guillain-Barre Syndrome (GBS)- (what Franklin Delano Roosevelt had)4, Chinese Paralytic syndrome, Chronic Fatigue Syndrome, epidemic cholera, cholera morbus, spinal meningitis, spinal apoplexy, inhibitory palsy, intermittent fever, famine fever, worm fever, bilious remittent fever, ergotism, post-polio syndrome, acute flaccid paralysis(AFP). 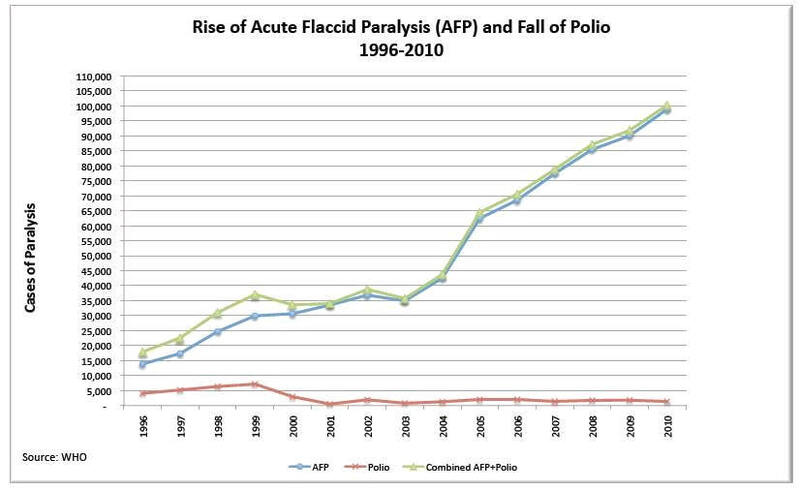 Before you believe that polio has been eradicated, have a look at this graph of AFP and Polio. If you are wondering why there is no data prior to 1996, go to the WHO website for AFP and you will see that there is no data prior to 1996, and note that AFP continues to rise in 2011. Acute Flaccid Paralysis (AFP) is just another name for what would have been called polio in 1955, and is used to describe a sudden onset of paralysis. It is the most common sign of acute polio, and used for surveillance during polio outbreaks. AFP is also associated with a number of other pathogenic agents including enteroviruses, echoviruses, and adenoviruses, among others. But in 1955, there was no attempt to detect anything other than polio in cases of AFP. Once the vaccine was mass marketed, the game changed. The opinions of learned anti-vaccinationist doctors are not permitted on CNN, Fox News, or in mainstream literature. Probably because if they were broadcast on such media outlets, the unsuspecting public would do an about-face. Instead, the publicity that mainstream media concedes, often involves a parent who is opposed to vaccination, after a child becomes vaccine-injured, matched up with a celebrity talking-head doctor. Dr. Stork had an all-out tantrum after JB Handley got some sense interjected (from the audience!) during Jenny McCarthy’s invite. 1. Statement from Clinton R. Miller, Intensive Immunization Programs, May 15th and 16th, 1962. Hearings before the Committee on Interstate and Foreign Commerce House of Representatives, 87th congress, second session on H.R. 10541. 2. Meier, P. 1978. “The biggest public health experiment ever: The 1954 trial of the Salk poliomyelitisvaccine.” Statistics: A Guide to the Unknown, Ed. J. M. Tanur, el al., pp. 3-15. San Francisco: Holden Day. 3. The Poison Cause of Poliomyelitis And Obstructions To Its Investigation by Ralph R. Scobey, M.D. 4. Goldman.2003.”What was the cause of Franklin Delano Roosevelt’s paralytic illness?” J Med Biog, 11:233-240. 5.Opening brief of Defendant and Appellant Cutter Laboratories Gottsdanker v. Cutter Laboratories (1960) 182 Cal. App.2d 602 pp. 31-33.